The Boardgame Players Association invites you to exhibit at WBC (the World Boardgaming Championships) on July 20–28, 2019, at the Seven Springs Mountain Resort, conveniently located off the Pennsylvania Turnpike in Seven Springs, PA. This gaming conference is unique and known worldwide for its emphasis on competitive play of boardgames. 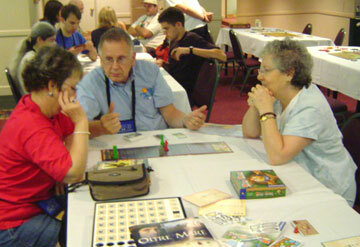 It continues to attract the largest turnout of boardgame competitors anywhere worldwide. Total attendance is estimated at 1,600 people. This is not an inflated figure using daily attendance and counting the same person multiple times; rather, it is a count of actual boardgamers in attendance — many of whom stay for a week or more. The BPA does not conduct events in Miniatures, Role Playing, Collectible Card Games or Computer Games although exhibitors are free to display those items. Exhibitor is a classification of BPA membership designed to give companies a chance to display their wares and services at minimal cost. An Exhibitor is entitled to one WBC admission plus an 8-foot table at WBC’s highest traffic exhibit space to display their wares and services, give out their literature, and/or conduct demonstrations of their products. Unlike a Vendor, an Exhibitor is not allowed to sell merchandise. If you want to both demonstrate your products in a permanent display and sell in the Vendor’s Room during Vendor’s hours, you should purchase both options. Note: The Demonstration Area is neither secured nor subject to exhibit hour restrictions. All paid attendees of WBC are free to play any game of their choice in designated open gaming areas; though games that are left unattended will be removed. However, signage, displays or other inducements to sell product are strictly limited to authorized Exhibitors and Vendors in specified areas. A free Banner in the Open Gaming Hall. To become an Exhibitor at WBC, read the Terms and Conditions of Membership, complete and print the Membership Form, and send funds via paypal to paypal@boardgamers.org or mail a copy of the form a check payable to “BPA” to 7766 Valley View Court, Hickory, NC 28602. Vendors: Exhibitors may also purchase one or more Vendors table(s) in order to sell their wares. See prices in the Terms and Conditions of Membership. Seminars/Special Events: BPA is pleased to provide use of three state of the art audio-visual classrooms with banked seating for seminars by its exhibitors and vendors. Introduce your company’s new and coming products and interact with your customers in a scheduled meeting. Designers can expound on their design philosophy and explain the whys and wherefores of their latest projects. Seminars are free to all official vendors/exhibitors. Submit seminar information via the Seminar Form. First come, first served—space is limited.